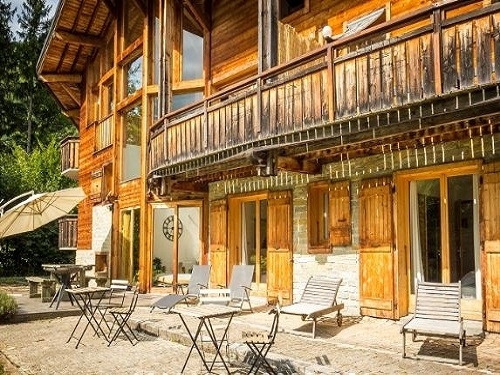 The Vaujany Mountain Lodge is a "little gem" just a stone throw away from Vaujany / Alpe d'Huez Enjoy the mountains at his best, in winter and also in summer The chalet offers you a family room, a studio directly connected with the main house and a double room, all en-suite. Relax on one of the balconies or terraces, all with spectacular views. Only 3min. from the cable car and snow secure slopes! The Vaujany Mountain Lodge is a light, modern and spacious chalet (170 sq. meters) in one of the little villages surrounding Vaujany. Decorated in style with love for the mountains this chalet offers you a wonderful place to stay with your family and friends in summer or in winter. We took a whole lot of effort in making this lodge stand out of everything else you will find in the French Alps. LIVING AREAS: Thanks to the modern split-level build, the chalet has a wide range of living quarters: A huge living room with fireplace. A great place to spend day and night; during daylight you can enjoy the stunning view of the Alps across the lake, at nighttime the starry night will pull you out of the cosy sofa. All can be enjoyed on one of 2 big terraces too. A very nice small living room/ mezzanine with a flatscreen TV and DVD A separate dining room with a very big table, a china cabinet with plenty of glasses, plates, bowls, etc. even your candles do not need to carry! KITCHEN: a modern and fully equipped kitchen where you can find every you need. Oven, micro wave, dish washer, blender, toaster, 3 types of coffee makers including a Nespresso machine, enough pans and trays, juicer, refrigerator and separate freezer. BEDROOMS: A very private double bedroom with bathroom and balcony A big family-room for 2 adults and 2 kids (in a bunk-bed), bathroom and a big terrace with stunning views over the lake. A studio, directly connected with the main chalet split over two floors with it's own bathroom. So all the rooms have their own bathroom and we can make the beds single or double, exactly as you wish. During WINTER, the free ski-bus stops at the lodges' doorstep and drops you of at the foot of the gondola in a few minutes time. The little resort of Vaujany is connected to that of Alpe d'Huez which will give you a great variety of slopes and off-piste terrain (250km). If you prefer to take your own car it also takes just a couple of minutes to drive to the ever going cable car, free covered parking place in front of this cable car and the free heated ski lockers we have available for you. Here you can leave all your equipment safe and warm. For SUMMERTIME close to the big passes of the Alps, like the Glandon, Croix de Fer and the Tour de France classic Alpe d'Huez of course, it's a dream location for cyclists, mountain bikers and motorcyclists. You can stay at the lodge completely self-supported, but we can also recommend a fully catered option. I makes life so much more easy and that's what holiday is all about, isn't it? FOR CATERING: on request we can arrange catering for you, for every evening or just for an evening you don't want to cook. You can stay at home in your own lovely chalet so the children can sleep and you are able to enjoy a delicious meal. Or if you don't want to do anything there is a private chef for you available in the chalet. Please let us know what you prefer and we will give you all the details. BREAKFAST: There is the possibility to obtain your fresh and crispy French baquets and croissants nearby or delivered by the bakery at your chalet in the morning. PRIVATE PARKING AND GARAGE: In addition to our private parking we have secure storage for bikes, mountain bikes and ski equipment. To offer you even more pleasant stay we make you beds in advance, there are towels for you available and at your arrival a tasty bottle of wine is waiting for you to start you holiday with a good glass of wine, cheers!! (towels and bedlinen are only provided in winter, in summer on request) We sincerely hope we may offer you the most wonderful and unforgettable stay in The Vaujany Mountain Lodge!! Please contact us for all your further information and wishes.